In 2005, Al-Taj Mill started with a production capacity of 120 tonnes every 24 hours. In view of the high demand for our products -- flour (72% of the production capacity) and chaff and bran mixture (28% of the production capacity) -- and in implementation of the company's policies, we increased production capacity and the number of production lines from one to two parallel lines with a capacity of up to 640 tonnes/24 hours. We also started building a new facility, comprising two production lines with a capacity of 640 tonnes/24 hours. This new facility, which will raise our production capacity to over 1280 tonnes/24 hours, is expected to start operation in 2019 to meet the local market demand. Al-Taj Mill follows a quality policy that deserves trust. Despite the changes in our business, Al-Taj Mill will remain faithful to its basic principles. 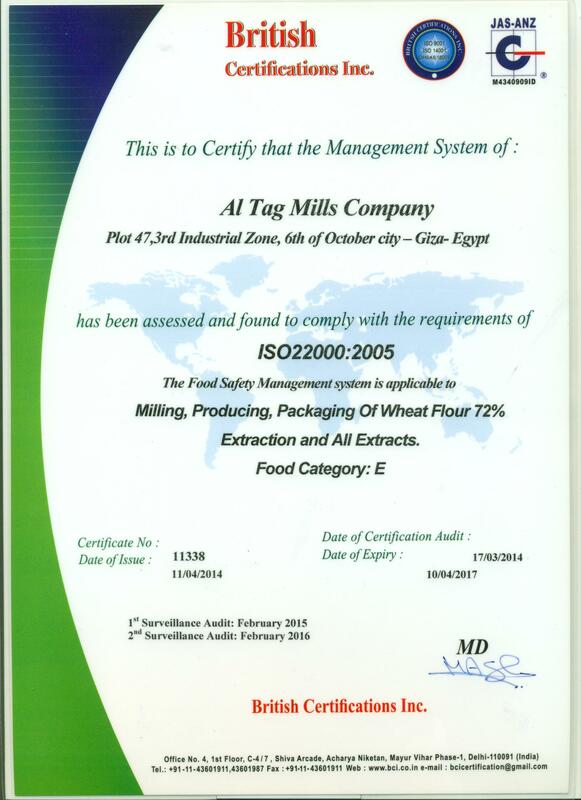 Al-Taj Mill continues to apply high standards for quality, food safety, sustainability, and occupational safety and health in all its sectors, including the ISO9001:2015, ISO14001:2015, ISO22000:2005, and OHSAS18001:2007 standards. Al-Taj Mill employs the highest level of global technology and equipment. In cooperation with Buhler of Switzerland, Al-Taj Mill built cleaning and purification lines that use Sortex sorter, sieves, and a number of other sorting devices. All these devices help to reduce the level of bacteria significantly and prevent the transmission of microbes to the final product. We were even able to reach zero results in germs tests. Buhler also provides Al-Taj Mill with the latest production lines that contribute to the smooth production of quality products after passing the grain cleaning and grinding lines, which are equipped with the most advanced technologies in the world. Al-Taj Mill uses P.I.C system that allows easy control of production lines and guarantees safety. The system also allows direct contact with Buhler round the clock to follow up the operations. In addition, the company uses WINCOS system that helps to follow up and resolve any malfunctions through direct contact to the manufacturers of this technology. The global technology adopted by Al-Taj Mill guarantees safe storage for final products and facilitates the movement of the product from the storage stages to the packing stage to meet the increasing demands. The company also employs a "Bulk Outload" technology, a system that allows filling containers directly with more than 40 tonnes of flour while placed on a transport vehicle. Al-Taj Mill started in 2005 with a storage capacity of 14,000 tonnes. We then increased our storage capacity to 35,000 tonnes in 2014. Since 2016, our company has been increasing storage capacity, reaching to more than 90,000 tonnes by the end of 2018. Al-Taj Mill continues to develop its workforce by sending technicians responsible for production and electrical and mechanical maintenance to many training courses in Buhler, Switzerland, to learn about the latest technology in the world.